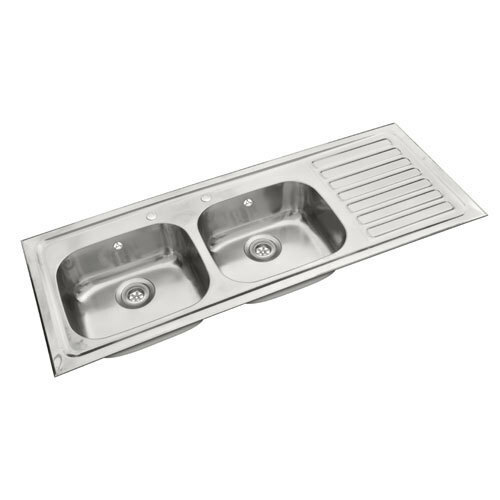 As an acclaimed enterprise of the industry, we are engaged in offering SS Double Bowl Kitchen Sink to our patrons. The offered product is examined on several parameters by our quality auditors to ensure defect free product at the patron's end. Our patrons can avail this from us at reasonable rates. Established in the year 2006, we, “Bluestar Polymers”, are top-notch manufacturers and exporters of kitchenwares & Bathroom wares. These products are of supreme quality and appreciated for their dependable performance. Backed by a sincere and reliable team of professionals, we are able to offer world-class products to the clients. This personnel indulges extensive market researchers with the sole aim of making regular upgradations in the existing array and at the same time develop new and innovative products. They conduct stringent checking of the range so as to establish the same at par with the highest standards of quality. Furthermore, these professionals streamline their actions to ensure time bound deliveries of the range. Under the leadership of our mentor, ‘Mr. Pankaj Kumar Mittal (Managing Director)’, we have established a strong foothold in this segment. His ethical business practices and transparent dealings have enabled us to win the trust and loyalty of our clients from reputed Hospitals, Pharmaceuticals Establishments, Tissue Culture Industries and Research Establishments.